...added some new floral shower curtains (which also happen to be organic). I love the bright yellow, especially as we come into summer. The art is the same. The furniture is the same. But yet, those two simple changes offer a nice little pick me up. It's wonderful that a simple can of paint and a few new shower curtains can be so reinvigorating. 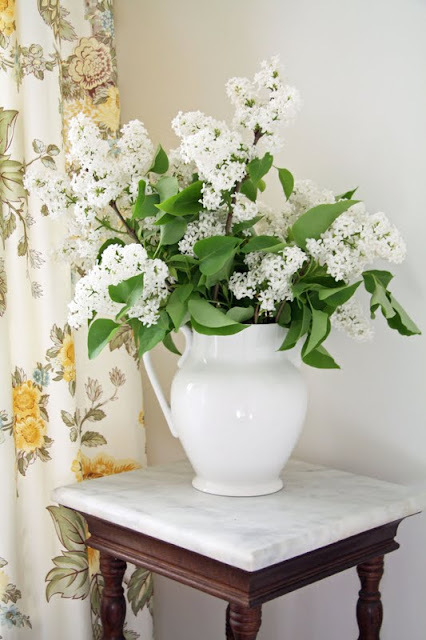 This is the first year I made a bouquet from our white lilac bush. Mostly because the white lilac bush is about ten feet tall - and with rather sparse blossoms. Thus, I had to do some acrobatics to get to the flower blossoms on top! They filled the room with a heavenly spring fragrance for days. Love the new shower curtains! Love the artwork, did you buy it? Beautiful! I love the new curtains and paint. It's so fresh and bright! what a stunning room! So fresh with the floral theme ~ I think I can smell the lilac from Australia. I want to paint that first image! How fresh!!! Very sweet and summery looking. Your bathroom is very pretty! We are going to be doing ours over also and I am debating on a theme. Yours gave me inspiration! We also have the shutters on the window. Trina. You had to know that the questions would start..."Where did you order the shower curtains from??? As always..very nice!!! Ellen R.
Your home is so beautifully light, it's truly lovely. Lovely to be sure.... shower curtain is a breath of fresh air. So beautiful! We are in the middle of our own bathroom renovations-- your lovely bath was at the front of my mind as I planned our own space. I love these changes (I also loved the blue too)! I remember watching an episode of Sarah's house and she put yellow in the bathroom and I absolutely loved it. Looks clean and bright and cheerful. Perfect! I'm loving the crisp look of the flowers and of course the claw foot. So pretty! I love the changes you made. Your shower curtains are gorgeous and the lilacs are the perfect touch for your room! I can almost smell them now. So beautiful! I always enjoy seeing you photos of your home!! I LOVE how everything is white in your home too. It's fresh and inviting. Plus when your back drop is white it allows you to freshen up the look in each room from season to season by simply changing out the linens and accessories! I love it! 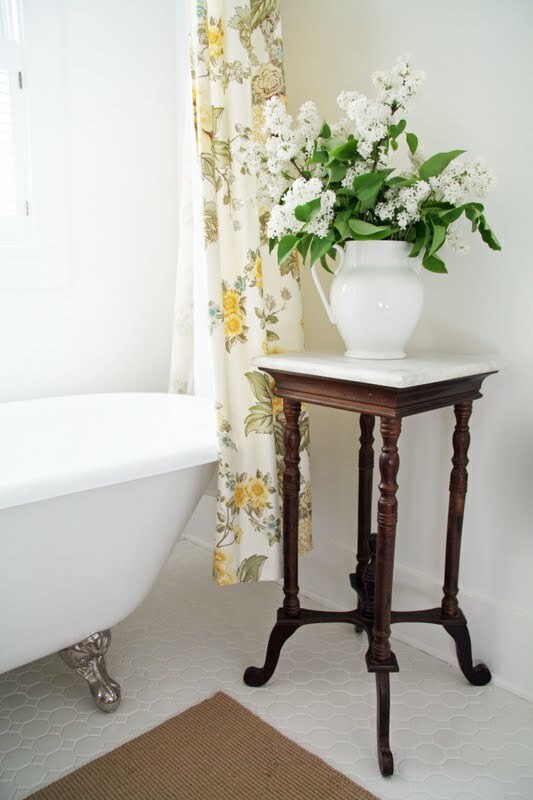 Reminds me of a gorgeous bathroom Sarah Richardson did in her farm house. You always make white walls work. They always look fresh and finished. Every time I try to use white walls it looks like I have primed the walls and they are waiting for paint? beautiful curtains. My bathroom needs a pick me up but we are still living with pink 50s tile. What can I do with that? Once again....You inspire me!! So PERFECTLY.....PERFECT!!! We all want to move in! Lovely! 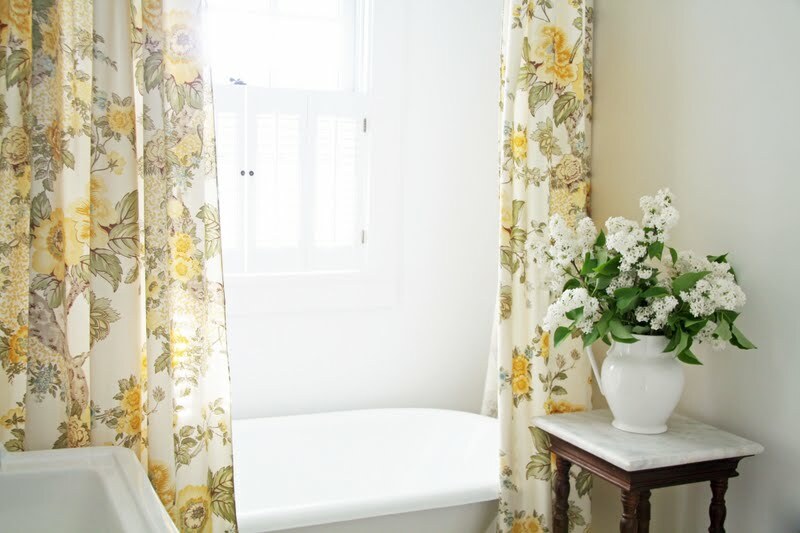 I like how the yellow floral shower curtain pops against the white neutral backdrop. I really need to find a white lilac bush. They grow wonderfully here, but purple is so much more common. White would be dreamy! Hi, I love the light fixture. Where did you find that. The whole room is very pretty. Thanks. Started following your blog not to long ago...absolutely love this bathroom. So clean but still cozy and happy. Just beautiful. How did you ever find the time? I like it! It is fun to change things up a bit. This is just breathtaking..so clean and crisp and FULL OF CHARM. One of these photos is going into my next "LOOK WHAT I FOUND" series...if it's ok with you. It's so very beautiful in all its simplicity. This is beautiful! 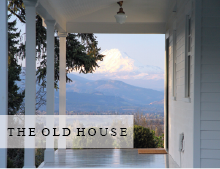 I love reading your blog and dreaming of having my own farmhouse someday. Thanks for sharing your home with us all. 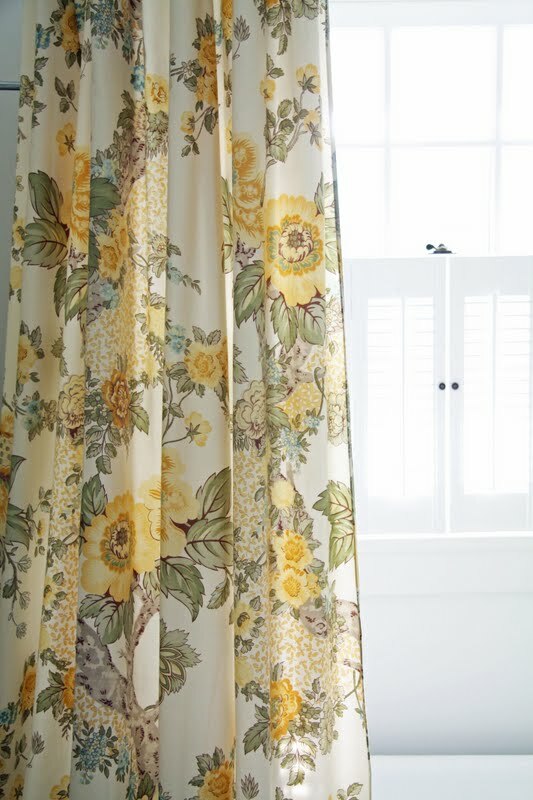 I love the shower curtain...it looks so refreshing for summer! Love this all of the pictures are just so pretty! I need to change a few things to. Would love to have this bathroom. The shower curtain is just beautiful. You done a great job on the bathroom. I love the shower curtains. Sunflowers are just beautiful, and they are my home state flower. I absolutely love the shower curtain. What a gorgeous pop of color in a soft way! Wonderfully done, just the right amount! I love it! 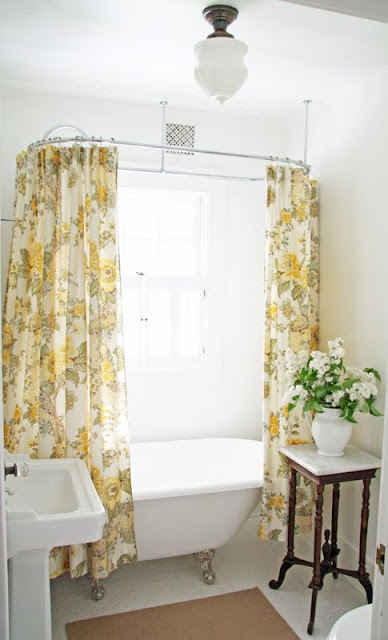 Are the actually shower curtains or did you modify draperies (I did that once and it worked)? It looks so relaxing... perfect for de-stressing the mind and the body as well. Really nice! The bathroom looks wonderful, I how much color the shower curtain provides. Turns out it's on sale currently and now I like it even more! Pretty shower curtains! Where did you purchase them? Oh, and the lilacs are stunning! I really liked the floral curtains! Trina! What a lovley house you have. Oooooh! Aaaaaaaaah! Let me grab some bubble bath, and I am ready! LOL! Acrobatic moves, huh? Sometimes, you really have to sacrifice a bit to make everything beautiful. Anyway, those lilacs can relax you whenever you enter your bathroom. And that curtain perfectly uplifted the mood! 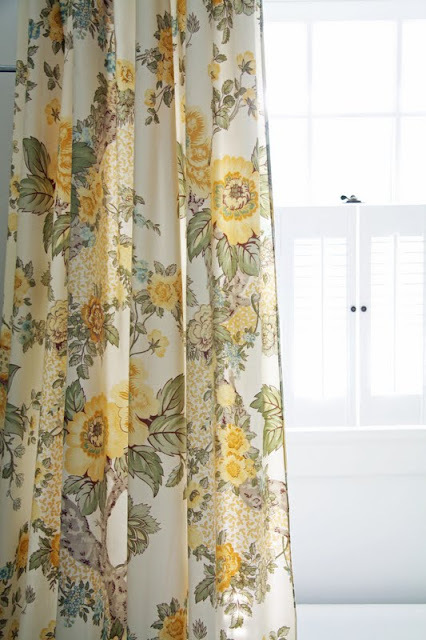 The link is in bold 'floral shower curtains.' They are from Pottery Barn. I just love your bath, it's so inviting, fresh and sunny. The first part of the reno was so inspiring, we just bought a new home with a clawfoot tub and now I'm even more excited to get my hands on it and make it sing just like yours. I was really admiring the first few photos until I got to the most recent update and my jaw hit the floor. It's really amazing what a can of paint and a couple of new shower curtains can do to a space. I know I'm a late comer to the party but could you tell me where you bought your shower curtain rod at ? Thanks so much for sharing and inspiring.